Here is Our Umbria. We hope you enjoy it with us! Everchanging, untouched landscapes in the green of winding valleys make Umbria a region that will never fail to amaze. Discover this region from insiders Trudy and Lorenzo, after 9 years of owning a small apartment in the medieval town of Citta della Pieve, Umbria, Italy, this tour is a celebration of all the wonderful things they have discovered. A deeply personal trip highlighting the things they love, the places that have drawn them to return to over and over again - the small discoveries that only time allows one to uncover. Although the train is the quickest route from Florence to our town of Citta Della Pieve (so we do sometimes go to Florence just to see an art exhibition), today we have decided to take a private bus as, enroute we will stop (for an hour or so) at The Mall, one of Europe’s best outlet shopping venues (an outdoor mall & quite attractive for a shopping precinct). It houses Gucci, Prada, Ferragamo and dozens of other brands and you will often find a bargain….but remember these places can be a little ‘hit & miss’ – sometimes you’ll find a treasure, other times nothing. Then we continue to Citta Della Pieve, our gorgeous hilltop country town surrounded by the protective stone wall built around 1300. For the next 5 nights you will be staying in Hotel Vanucci which was originally built in 1887 by King Vittorio Emanuele II as an elegant villa. Lorenzo & I stayed in this hotel on our first reconnaissance here before we purchased. It has lovely grounds overlooking one of the many medieval churches in town. Next door is Café Artisti, a place we often sit at to have a drink at the end of the day (try their Negroni, it is fabulous! ), so the hotel is well placed to explore town. The afternoon is left for you to settle in and discover the town by yourself. We suggest you walk into the Castelo San Rocca and look out to the Umbrian plains where centuries ago sentry stood by watching for the rising dust for pre warning of a Perugian invasion. Early evening we will have pre-dinner drinks on the loggia of at our home, a short walk from your hotel. Our small apartment is not grand, but rather indicative of the local building techniques which we love – it is in a palazzo which was built around 1650, and was divided into 4 apartments by a developer about 30 years ago. It is quirky with incredibly thick walls, chestnut ceiling beams and floors that dip everywhere, and we love it for all these oddities. For dinner we are going to our favourite restaurant, and the one that we always celebrate our first meal when we arrive in town, ‘Bruno Copper’. Family run since 1965, it serves local food cooked in a wood fired open oven. We have enjoyed countless meals here over the years! Inclusions – All transport, Pre Dinner Drinks, Dinner with local wine. The plan this morning is a discovery of our town - a GUIDED WALKING TOUR with a local historian who has a lot of knowledge of Citta della Pieve. One of the Renaissance’s famous artists, Perugino was born here, and he is credited with beginning perspective in art. Tucked away in a small oratorio, you will see his painting, ‘Adoration of the Magi’, painted in 1503 which shows an idealised view of the town and local Lake Trasimeno. At the conclusion of the walking tour we will go to another of our favourite local venues ‘Saltenpicchio’. In this bar and casual restaurant, we will try a few local wines and sample some local cheese and meats. Then we proceed by taxi & train to the nearby town of ORVIETO. Built on a mountaintop and dating to early 1200’s, this town is renowned for its magnificent Basilica in striped green & white marble. Rather than touring the town, we want to show you its incredible labyrinth of massive underground tunnels and rooms. Carved out of the soft tufa rock over the centuries - these underground rooms provided a means of escape in case of a siege and were used by the locals to house their wine and olive oil. Although underground they are expansive (and definitely not claustrophobic as the ceilings are very high) - an ingenious solution to finding space to expand when constrained by sitting high on a mountaintop! Following this tour you will have some free time in Orvieto before we return to Citta della Pieve where you have the evening at your leisure. 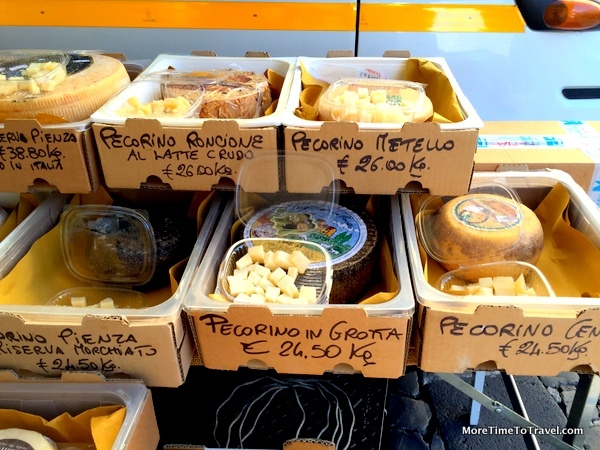 Inclusions – Guided Tour of Citta della Pieve, Light lunch of Wine, Cheese & Meat, Return Train & Taxi Transport to Orvieto & Guided tour of Underground Orvieto. The Umbrian capital of Perugia is not as well-known as its Tuscan or Lazio counterparts due largely to the fact that it is not as easily accessible, however it is a delightful city with an interesting history. We will catch the morning local train to Perugia. Our first stop there is an historical textile weaving workshop, one of the last remaining in Italy where hand weaving on jacquard looms is performed. These authentic local textiles can be seen in many famous Renaissance paintings, and today this art is kept alive by Marta, the 4th generation of women in her family to run this workshop. Set in a beautiful stone church once owned by the Benedictine monks, this is a magnificent local ‘find’. Following this we have a private guided walking tour around this ancient city explaining the importance of this Umbrian capital city. Lunch will be at a small local Osteria set in the priory building of a Gothic church. After lunch we continue to a local stained glass workshop located in a fifteenth century residence, where 5 generations of a family have been baking stained glass since 1859. Today is a favourite of mine as it includes ancient hillside towns, Renaissance art, delicious wine and amazing contemporary architecture! We have a private bus taking us to Tenuta Casterbuono winery - part building, part sculpture and part land art installation, designed by Italian sculptor Arnaldo Pomodoro. Nicknamed “Il Carapace” (the tortoise shell), this flattened copper dome is the centrepiece of a vineyard planted with Sagrantino di Montefalco grapes. Here we will have a wine tasting of the delicious red wine that this grape produces in this dramatic architectural tasting room. Contemporary architecture and aged old techniques produce spectacular results! Following this we visit the beautiful hillside town Spello where we have a short guided tour of Cappella Baglioni, a side chapel of the church Santa Maria Maggiore. Commissioned by the powerful Baglioni family and painted by Pinturicchio in 1501, this colourful fresco about the life of Jesus paints the benefactor into it, ensuring his 15 minutes of fame…. albeit with time travel. Lunch will be at a gorgeous local Trattoria situated in a building that dates back to Roman times. After lunch we will visit the wine town of Montefalco with some free time to wander its ancient strada before returning to Citta Della Pieve for free evening time. On the first Sunday of the month and the preceding Saturday (confusing I realise but if Sunday is the 1st of month then it’s the correct weekend!) – Arezzo holds Italy’s best antique market! We have been so many times and each time it feels like ‘a discovery’. Most of our house contents were purchased here – paintings, furniture, antique handmade linen – all spread out over this lovely Tuscan town (where Oscar winning film “La Vita Bella” was filmed – do watch it before you visit). We just wander for hours, chat to the stall holders, drink coffee and Spritz Aperol, have lunch in one of the little trattorias and, well, generally just explore. At the recent market a few weeks ago, Lorenzo bought a Roman coin – very well priced for something 2000+ years old - it truly does have some incredible ‘finds’. So the plan is to catch the train there together and spend the day in Arezzo at your leisure – wander the hundreds of stands and view their product, or sit and enjoy a lazy lunch in this gorgeous Tuscan town. It is a living working town so if you tire of the market, it does have shopping and all the mod cons you would like. Lunch is on your own – we will recommend some of our local favourite restaurants - simple, delicious authentic and well priced. We return to Citta Della Pieve by train for a farewell dinner at another of our favourite venues, Bistro del Duca – a tiny restaurant where local produce is king! Following breakfast we will get taxi transfer to local train station for departure to your next destination.